The HCI Fitness Sprint Outrigger Scull Rowing Machine is a hydraulic piston rower that gives the user the genuine feeling of rowing on water in a compact and sturdy steel design. This rower uses two pistons; one on each arm. These allow the users to adjust the level of resistance for each arm separately. For example, if your right arm is weaker than your left arm, the resistance on the right rowing arm can be set to a lower resistance than the resistance you’d like on the left rowing arm. It features 12 levels of adjustable resistance on each rowing arm that can easily be adjusted by rotating the collar on each of the pistons. This personalized data can be displayed individually or rotated automatically by using the monitor’s “Scan” feature. The workout data is easy to see because of the large display monitor and oversized text. The performance monitor even has built-in workout programs that focuses on calories and strokes. The monitor is simple to use and is operated by four main buttons on its front. However, the calorie count is considered by many to be inaccurate. As for comfort, this rower seems to have it all! Its seat has an ergonomic design and rollers mounted on the seat rails. This will allow users to exercise for extended periods of time without the worry of discomfort. The handgrips are very soft and comfortable, but there are reports that within a year these handgrips might become loose. The pivoting footplates on this rower are quite large, and can accommodate almost anyone as well as allow the user’s feet to move naturally. The machine is almost completely made of steel, including parts, and is easy to store with its foldable handles. However, due to it’s almost all-steel build the rower may have a tendency to squeak after strenuous or extended use. The machine can accommodate up to 275 pounds of weight, and users of all heights seem to have no issue with it. 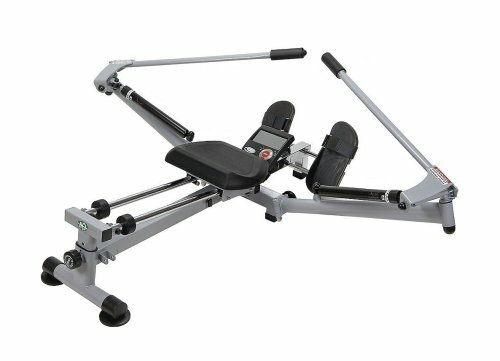 The assembly of the rower is simple, and most users reported having the machine completely assembled in roughly 15 minutes. any idea where this item can be purchased for the prices listed above?